We may have won the space race, but Russia is beating the pants off us in the dashcam race. That has become painfully evident in the aftermath of last Friday's meteor attack in Chelyabinsk. Within minutes of the meteor exploding in the sky above Chelyabinsk, videos taken from scores of "dashcams" in Russian vehicles began to appear online... there were so many videos popping up online that PC Magazine felt the need to publish "The 12 Craziest Videos of the Russian Meteor"! How demoralizing is that? Everyone is Russia has a dashcam in his or her vehicle, always running, always ready to capture stunning images of mammoth meteors steaking across the sky and exploding over their heads. Where is the U.S. in all this? Nowhere. I don't have a dashcam, and I don't know anyone who does. My Subaru has a nifty back-up cam, but that only works when I'm in reverse, and I would have to drive around town backwards an awful lot before I'd ever capture a meteor crash, and even then my car doesn't actually record the images from the back-up cam, so what good would it do? No, we must, as a nation, accept that the Russians have us beat every which way to Sunday here. The "official" reason for this, I have read, is that nobody has car insurance in Russia, so motorists buy dashcams instead, and keep them on all the time, so that if anyone smacks into them they can prove it wasn't their fault. It turns out that the cams also come in very handy if your country is ever invaded by aliens. Because that's what all this meteor hubbub over the past few days has really been about. Think about it: in the course of less than 24 hours, a meteor exploded over Russia, a huge fireball was sighted in the sky over San Francisco, and a 150-foot meteor streaked past our planet at uncomfortably close range... You probably hadn't even heard about the San Francisco fireball, had you? Of course not! They didn't want you to know! Ever heard the old expression "Once is happenstance, twice is coincidence, three times is enemy action"? Uh huh. Three rocks streaking into our orbit all at once is a very very bad sign. How many UFOs do you think snuck into our atmosphere the other day while we were all distracted by the meteors? At least three, I'm guessing. The real question is, did the aliens see the convergence of all these space rocks approaching earth and decide to take advantage of the opportunity, or did they maneuver the meteors into position themselves?? 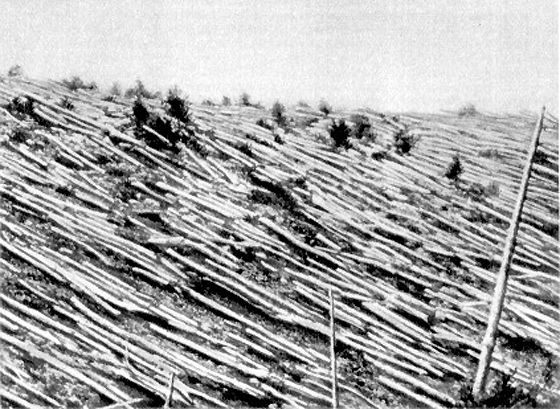 A few hundred of the estimated 80 million trees flattened by a 1908 "meteor" explosion above Tunguska, Siberia. It may seem petty of me to bring this up when I should be rallying to fight off the alien invasion, but this whole thing brings up another thing that Russia has us beat at: meteors exploding in the sky. You see, this isn't the first time a "meteor" has caused a multiple-megaton blast in the skies above Mother Russia. Way back in 1908, something streaked through the sky above the Tunguska region of Siberia, and exploded just before hitting the earth... Shockwaves were registered in England, people in Asia could read newspapers in the dead of night because of the glow, and 800 square miles of forest were flattened instantly, the trees stripped bare like matchsticks and laid out in a radial pattern around the epicenter of the blast. Damn you, Russia. I'd rip on you some more, but someone has to do something about this attack business!